MillionaireCasket.com, the leading China caskets manufacturer，has recently added a new range of mahogany caskets to its product catalog to develop the international market. MillionaireCasket.com, the leading China caskets manufacturer，has recently added a new range of mahogany caskets to its product catalog to develop the international market. It is worthy to mention that all these new items are offered at discounted prices, up to 30 percent off. In the coming days, it will announce more good products. The supplier hopes to provide worldwide distributors with all kinds of cost-effective caskets. At present, almost all of MillionaireCasket.com's items are available at low prices; they are highly prized by the international clients. More importantly, all the affordable mahogany caskets are made from top quality materials by experienced staff. The company’s mahogany caskets can be made in different sizes. As a professional casket manufacturer, it offers flexibility in terms of wood species, finishes, interior materials, interior styles, head panel embroideries and customization of many other features. On the other hand, the key reason for the company to be successful in the casket manufacturing business is that the prices of its items are fair and competitive. MillionaireCasket.com, as the industry and trade integration company, can provide you more competitive prices. Just as the company’s chief executive officer said, “Our wood caskets will save you a lot of money, because you are buying directly from the original manufacturer, not a 3rd party handler.” For those who place big orders, MillionaireCasket.com also offers extra coupons. 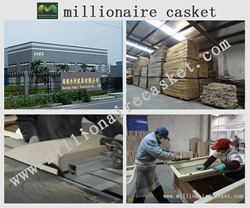 MillionaireCasket.com is a leading casket manufacturer from China, and focuses on the business of casket wholesale. The standard quality control policy is strictly applied here, and a third party quality assurance is also available. For more details about its items, clients can visit http://www.millionairecasket.com/70-mahogany-caskets.